Hans Kelsen and Max Weber are conventionally understood as the original proponents of two distinct and opposed processes of concept formation generating two separate and contrasting theoretical frameworks for the study of law. 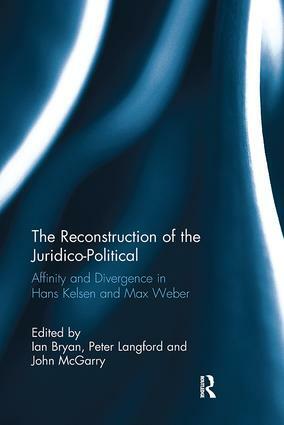 The Reconstruction of the Juridico-Political: Affinity and Divergence in Hans Kelsen and Max Webercontests the conventional understanding of the theoretical relationship between Kelsen’s legal positivism and Weber’s sociology of law. Utilising the conceptual frame of the　juridico-political, the contributors to this interdisciplinary volume analyse central points of affinity and divergence in the work of these two influential figures. Thus, the chapters collected in The Reconstruction of the Juridico-Political offer a comprehensive reconsideration of these affinities and divergences, through a comparison of their respective reconstruction of the notions of democracy, the State, legal rights and the character of law. From this reconsideration a more complex understanding of their theoretical relationship emerges combined with a renewed emphasis upon the continued contemporary relevance of the work of Kelsen and Weber. Ian Bryan is Senior Lecturer in Law, Law School, Lancaster University, UK. Peter Langford is Senior Lecturer in Law, Department of Law and Criminology, Edge Hill University, UK. John McGarry is Reader in Law, Department of Law and Criminology, Edge Hill University, UK.